The Outdoor ColorBright™ (IP65) Color Changing 300 LED strip light can be purchased in an 8' or 16' 5" reel. 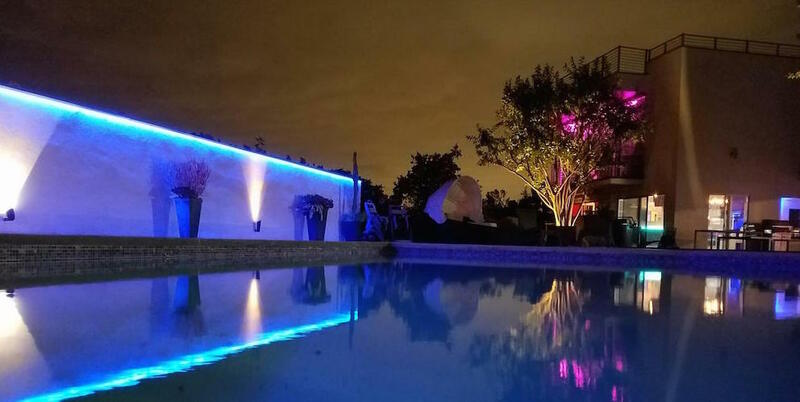 Sometimes referred to as "color changing LED tape lights," the strips are as versatile as they are customizable and can be installed in basically any space you can imagine. Using a remote controller, you can change the settings, brightness, and colors of the light strips to almost any color you can imagine! The 300 LEDs per 16-foot reel of color changing LED strips will shine twice as bright as the 150 LED per reel lights. The IP65 rating means that the LED strip lights are able to withstand jets and splashes of water from all sides. It cannot be submerged in water, but it will withstand the elements. We also recommend outdoor lights for use indoors in high splash areas or if you're looking for a strip that is easier to clean. Should you select 12 Volt (12v) or 24 Volt (24v)? Depends on your application. The main difference between the two is the fact that the 24v strips can be ran for longer distances than the 12v strips can due to Voltage Drop. Voltage drop is the gradual decrease in voltage along a circuit. If your project requires a very long run of LEDs, we would recommend the 24v strips. However, there are also many projects that 12v is required (automotive or marine applications). Please feel free to live chat with us, email us, or call us with questions. Before noticing any unwanted color variations or dimming at the end of your run of lights, it is recommended that you run no more than 32' in series when using 12v or 48' in series when using 24v. Q :What is the importance of UL Listed lighting? Q: How do I install RGB color changing LED strip lights? Learn the basics of installing RGB LED strip lighting under counters, connecting them to the controller, mounting and controlling them, here. Consult our design team for extra assistance. Yes. Be sure to reseal the strip light each time it’s cut to prevent water damage. Q: How do I install more than one RGB LED strip light to a controller? You can use one controller to control multiple runs of the RGB strip lights. This can be achieved by stripping the ends of the wires from multiple runs and connecting them together before inserting them into the RGB controller. Two important things to note here. Make sure you are not exceeding the amperage / wattage maximum of the controller when you are installing multiple runs. Also, if you are using solderless connectors, make sure that the markings on the strip are used as the guides for polarity and not just the colors of the wire. The colors associated with the polarity markings will change depending on the side of the strip the connector is attached to. Click here for a detailed installation guide. Consult our design team for extra assistance. Q: What is a 5050 SMD LED chip? 5050 SMD (Surface Mounted Diode) represents the size of the LED chips on the strip. A 5050 SMD chip measures at 5.0mm x 5.0mm. Click here for more information on LED chip sizes. Q: Can RGB chips be controlled independently? No, these strips are not. The entire strip will emit the same color light. You need to use individually-addressable LED chips which are normally found on digital strips. Please contact the design team for more assistance. Q: Can I hard wire RGB strips into a wall dimmer? The RGB strips are not compatible with conventional wall dimmers that are designed to be hard wired. We have beautiful and easy to install RGB wireless wall dimmers that are compatible. Please contact the design team for design solutions. Q: What is the maximum run length of RGB 300 strip lights? Q: I am using RGB lighting and want to control them via a DMX controller – are your lights fully controllable? Yes. Our lights work perfectly well with DMX systems. However, our strips are not individually-addressable. For example, if one chip displays red then all of the other chips will also show red. If you require chasing or independent-control then you will need to use a digital strip. Q: What is the difference between RGB 150 and RGB 300? The 150 or 300 directly correspond to the number of LED chips per reel. Twice the amount of light is emitted, thus double the amount of power is also required.